So I was asked a little while back by N/a to whip up something to buff the MAD Tank. Rather than simply buffing its damage or HP, I thought I could make the unit more interesting by giving it an EMP effect. This way, it could function as a utility unit to assist in bunker busting rather than being yet another asset Soviets have to bust bases (V2's, IC, Heavy Tanks, Tesla Tanks, etc). However, I realize this diverges a lot from vanilla game play so I'm unsure this would be a good change to test in the playtest. I don't really have any nostalgia for the original RA, so I don't know how upset people would be with a change like this. That's why I need opinions. MAD tank disables defenses and powerplants for a small duration on it's final pulse. With some additional work I could probably extend this functionality to all buildings. MAD tanks no longer affect vehicles (why do seismic waves affect vehicles?). This also lets you mix it into your armies without damaging your own units. MAD tanks have +1 range (same range as Tesla Coil). Looks cool, would give it needed utility. It's not exactly a cheap unit! I also think it needs to be underlined; it's destroyed after use. There's no retention, and it's no good for defense at all. How does IC affect this? How long is the proposed effect? Same duration as spy power down? MAD tank can be IC'd like normal. If you mean the defenses, they'll still be disabled, but won't take damage. Disable lasts about ~10 seconds. Once I get some test games done to demonstrate it's not OP, I plan to increase the HP a bit. I like this direction more since I want there to be some counter play available to the defending player. The adrenaline rush to kill it before it goes off, you know. You can always use an IC to get a perfect strike done as well. Also, since some people on Discord have been confused about this, I am not proposing adding an EMP weapon to the game. It wouldn't fit in with the lore. I called it an EMP weapon just so it'd be easy to explain. It would rather be something along the lines of "Strong seismic waves disrupt building function". as someone who uses madtanks from time to time, i must say the emp would be a nice feature for this rarely seen unit. But i think players (maybe most of them not sure) would be upset about this change. 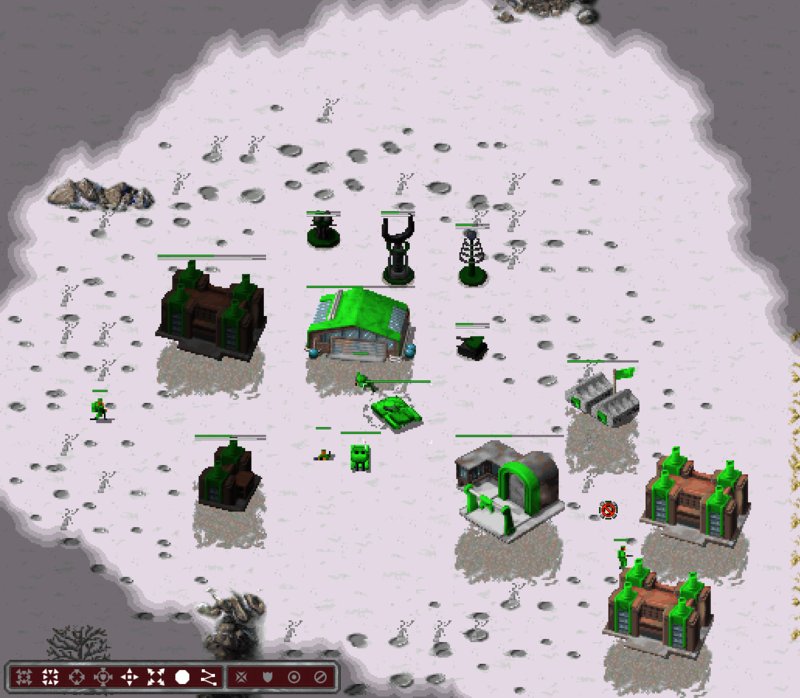 The reason for this is not only the nostalgia (Openra is and should be different to the original), its also because they are often already upset and crying around if it is used against them. Like "Wtf half of my base is destroyed ... ragequit"
Especially if its combined with ic and chrono. Not understanding that it needs some preparation and teamwork to get such a move started and often its needed to end a painfully long lasting game. It is really hard to use the madtank if you have no teammate with a chronosphere whos working together with you, or might not understand you, is too busy, dont want to support such a move. One way could be to buff the hp but i'm unsure it it should have more than the mammoth they are already the units with the most HP, so this would make it the top hp unit in game. But i'm sure there are also other ways to tune them in a nice way sometimes it just needs a good idea. I don't know if not damaging vehicles is the right way here. MAD tanks no longer affect vehicles (why do seismic waves affect vehicles?). If you think about earthquakes they of course damage vehicles, and these seismic waves can destroy whole bases and leave vehicles undamaged, that would be a rather unexpected behavior. So if you want to make it more realistic infantry should also be damaged (maybe infantry and vehicles not as much as buildings). This also lets you mix it into your armies without damaging your own units. While this is of course nice and would open new tactical usage of them, another side effect would be that theirs only chance to fight back would be gone, if an army catches them while you try to sneak into an enemys base (yes thats another way to use them likely the demotruck). And of course it would turn another funny tactic off, the possibility to blow up masses of tanks. I'm a bit split at this point but that something should be done is clear, damaging vehicles, buildings and not infantry is a strange thing. Just saying the most realistic change would maybe be to damage buildings 100%, vehicles ~60% and infantry ~30%. But it could be hard to code, not sure if the DamageMultiplier trait can be used for this. So more opinions about the madtanks would be nice to hear, i'm sure it can be improved nicely. That means (the 33% Dmg of current healthpoints) you are not able to destroy anything after a nuke did first important steps (i.e. also taking off the defense). I think this diverges too heavily from the original. The MAD-tank is similar to the silo IMO: it will probably never be really useful if you play at a higher skill level and making it useful would mean to entirely change the role and purpose we know from original RA. So I think this change does more harm than good and we should focus on other things that are actually in the game. I deleted my previous reply as I didn't find it helpful anymore after reading it again. I liked it. It was honest. I think its a great idea.. and unlike lawANDorder i dont think it diverges too heavily from the original, i think you only think that because of the word EMP and as orb said: "I called it an EMP weapon just so it'd be easy to explain. It would rather be something along the lines of "Strong seismic waves disrupt building function"
That is the only point I disagree, I would like to see it as a Vehicel which you send from the backlines into enemys Base or IC it with the Mainarmy and send it to another position where your army isnt fighting at this moment, but you want to move after the MAD Tank selfdestruct itself. For this role it will need a speed buff. The reason I commented here in the fist place is that Orb put this in the context of the playtest. If you test the build linked in viewtopic.php?f=82&t=20870, which is a preview of the upcoming playtest, you'll notice that it has massive changes. Everyone in this thread understands RA gameplay better than me and is more competent than me to evaluate what balance implications these changes will have. As stated before, I'd be happy and this is all that matters to me if those people focused on balancing these changes and defer fundamental changes to units to the next cycle (unless it turns out that exactly these changes are required for balancing, but that would be really surprising). I'll silently accept whatever results from the discussion around "EMP" MAD tanks or "sniper" artillery then.